This family is made up of the familiar bottom-living octopuses and contains the majority of the genera and species which make up the Order Incirrata. The taxonomy of the family is poor with more than 30 genera coined, of which the following 24 are generally accepted as valid. There are over 200 species worldwide with the majority lacking detailed descriptions. Editorial note: This page was written prior to the recent paper by Strugnell, et al. (2013) which restructured the classification to the form seen above. Previously the above taxa, with the exception of the Amphitretidae were included within the family Octopodidae. Members of this family are the best known of the octopods. There is considerable diversity within this family. They range in size from pygmy species mature at under one gram (e.g., Octopus wolfi) to the Giant Pacific Octopus (Octopus dofleini) of the North Pacific reaching weights in excess of 150 kilograms with an arm span of over 5 m. All are muscular with one or two rows of suckers. 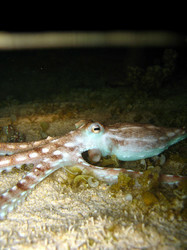 Body proportions vary between species, from animals with arms approximately twice the mantle length (as in the blue-ringed octopuses, genus Hapalochlaena) to those with arms up to 10 times the mantle length (as in Ameloctopus) (see title photos above). 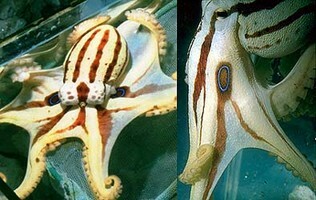 The skin also varies between species from smooth (as in Benthoctopus - left photograph below) to highly sculptured (as in Octopus cyanea - right photograph) below. Benthoctopus levis (left) from Heard Island, Indian Ocean (photograph copyright © 1996, T. Stranks); Octopus cyanea (right) from the Great Barrier Reef (photograph copyright © 1996, Mark Norman). Suckers in one or two series. One of the third arms modified in males (= hectocotylus), as an open sperm groove (running along ventral edge of the arm) to subterminal tip (calamus) and a modified terminal tip (ligula), typically spoon-like. Internal shell reduced to a pair of stylets or lost. Stomach and caecum posterior to digestive gland. Lateral radula teeth (if present) simple, with single cusp. There has been little research into the phylogeny of this family as the morphology of the majority of genera and species are yet to be described in detail. Molecular analyses presently are rudimentary. Earlier works have recognised up to four subfamilies on the basis of relatively few characters, particularly the number of sucker rows and the presence or absence of an ink sac and a diverticulum branch off the crop (see Voss, 1988). These subfamilies are Octopodinae (double sucker row, ink sac and crop diverticulum present), Eledoninae (single sucker row, ink sac and crop diverticulum present), Bathypolypodinae (double sucker row, ink sac absent), Graneledoninae (single sucker row, ink sac and crop diverticulum absent). The latter two subfamilies are restricted to deeper waters and Voss (1988) discusses possible adaptations of these groups to lightless depths. The validity of these groupings have not been firmly established and there is a high likelihood of convergence in these few characters. The most detailed treatments of this family are provided in Naef (1923), Sasaki (1929), Robson (1929) and Nesis (1982). Members of this family mate by the male transferring sperm packages (spermatophores) to the female using the modified third arm (hectocotylus). Spermatophores are shunted along an open groove on the hectocotylised arm to a spoon-shaped tip (ligula). The male places the spermatophores within the oviducts of the female. Females can store sperm for up to 10 months (Mangold, in Boyle, 1983), and in many species immature females can mate and store viable sperm until mature. The elongate spermatophores evert within the oviduct to form a sperm bulb (spermatangia). In certain species, the everting spermatophore is covered in sharp teeth which aid the penetration of the sperm bulb along the oviduct through the oviducal glands and into the body of the ovary. In most species, sperm is stored within or adjacent to the oviducal glands. Fertilization typically occurs as the eggs pass through the oviducal glands. Hatchling paralarva of Octopus cyanea, off Hawaii. © 1996, Richard Young. Egg size varies between different species and falls into two broad categories, according to Boletzky (1977): "Large-egg" species produce eggs greater than 10% of the mantle length (as few as 50, up to 30 mm long), and "small-egg" species produce many small eggs less than 10% of mantle length (up to 600,000, as small as 1.5 mm each). Hatchlings of most large-egg species are well-developed and adopt a benthic habit on hatching, although this generalization does not hold for some pygmy species such as O. bocki. These young typically possess arms with many suckers and adult-like skin sculpture and colour patterns. 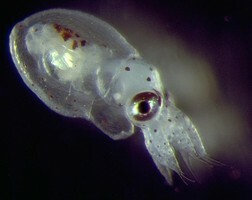 The hatchlings of the "small-egg" species live in the plankton in their early stages and are characterized by short arms with few suckers and simple colour patterns consisting of a few large "founder" chromatophores (Packard, 1985). The morphology of these planktonic stages changes rapidly on settlement, quickly transforming to resemble the adult. The females of all species within this family brood, remaining with the eggs until hatching, cleaning the eggs by jetting water through them as they develop. Females typically cease feeding prior to spawning and establish themselves within the safety of a lair. Eggs are typically laid in strings or festoons, where the egg stalks are interwoven or glued together. Most species attach the eggs to the substrate, shells or man-made objects. Females of several species in the genera Hapalochlaena and Amphioctopus carry the egg strings on their arms, enveloping them within the webs. The duration of development of the embryos is longer at low temperatures than at high ones, and is longer in large eggs than in small ones. Octopus vulgaris eggs (2.0 mm) develop in 30 days at 20 C and in 65 days at 15 C. The large eggs of Bathypolypus arcticus (i.e., 15 mm) need one year to develop (O'Dor and Macalaster, in Boyle, 1983). Female Abdopus abaculus brooding eggs. 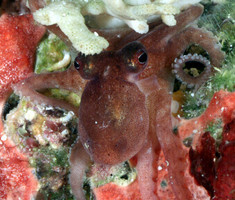 Spawning is terminal in the majority of octopodid species, i.e., females die shortly after the last embryos have hatched. In other species, e.g., Octopus chierchiae, spawning is intermittent, where females resume feeding after the embryos hatch, and grow until the next spawning takes place (Rodaniche, 1984) although the ovaries do not regress and regrow between spawning episodes. 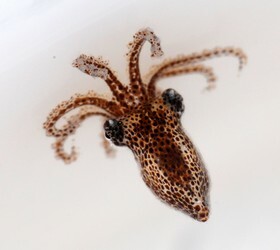 At the end of their life span, octopuses tend to lose mass, coordination, and the ability to express complex body patterns (see brooding female Abdopus abaculus below). Members of this family prey on a wide range of animals, although primarily crustaceans ( View Abdopus foraging). Certain species appear to be generalists (one individual of Octopus dierythraeus was caught carrying crabs, a bivalve shell, a fish, a polychaete worm and a freshly decapitated octopus; Norman, 1993a), while others concentrate on a single group. Octopus alpheus has a diet apparently restricted to crabs (Norman, 1993). Certain species use the radula to drill bivalve or gastropod shells (e.g., Nixon and Maconnachie, 1988). Octopus ornatus preys heavily on octopuses of other species (Norman, 1993b). Cannibalism has also been reported for many species. 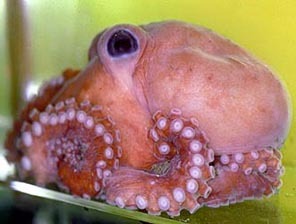 As in all cephalopods, octopuses are fast growing. At hatching, Octopus vulgaris juveniles weigh 2 mg, growing to weights of 2 to 3 kg in 12 to 18 months (Mangold, in Boyle, 1983). Paralarvae of this species feed on planktonic crustaceans, whereas the newly settled young feed mostly on benthic prey. The conversion rate of young Octopus vulgaris is 50% when fed crustaceans. The life-span of members of the Octopodidae varies between about 6 months in small tropical species to four years in cold water species such as Bathypolypus arcticus (O'Dor and Macalaster, in Boyle, 1983). by pumping the arms and flared webs ( View Abdopus medusoid swimming). In addition to using these modes, two octopuses (Amphioctopus marginatus and Abdopus aculeatus) are known to walk bipedally ( View Abdopus aculeatus walking). Many shallow-water species exhibit a remarkable match to the color and texture of the background (in spite of the fact that they are color blind!). This camouflage is produced by chromatophore combinations, passive reflection from specialized cells (iridophores, leucophores) and sculpture formed by raised (even branched) muscular patches and papillae (see image below). Variation in skin anatomies leads to a wide range of species-specific body patterns and skin textures. For example, body patterns in Octopus bocki appear limited to fairly uniform purple with iridescent patches on the mantle and around the eyes, while Octopus cyanea can display numerous patterns using differently colored chromatophores. 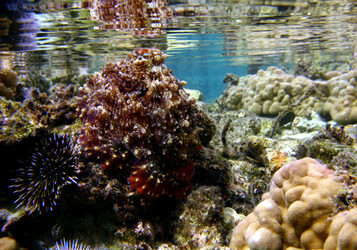 For many species, activity is restricted to specific periods. Many species are only active at night (e.g., Octopus ornatus), while others are predominantly day active (e.g., Octopus cyanea), see Houck (1982). Certain species are further restricted in their activity periods to the duration of low tides, only emerging to forage in rock pools on exposed intertidal reefs. Octopuses of this family seek shelter in a number of ways. Many species utilize or construct holes as temporary or semi-permanent lairs, often recognised by prey remains or small piles of pebbles surrounding the entrance. These lairs may occur in corals, rock and rubble or can be excavated in sand or mud sediments. Many night-active species such as O. ornatus simply excavate a hole anywhere amongst rubble in the substrate at the end of a night's foraging, covering themselves with rubble or sand during the day. 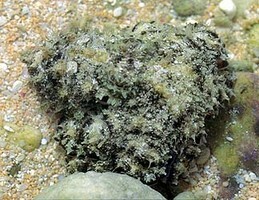 Other species which occur on open sand substrates (such as O. kaurna) simply bury in open sand. 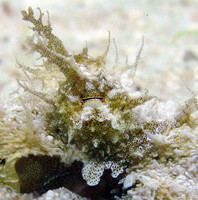 Certain species such as O. berrima (photograph below) possess a ridge-like keel around the lateral mantle which may aid in guiding the animal below the sand. This species frequently buries below the sand, occasionally raising a single eye like a periscope to scan. In some species (such as O. bimaculoides) larger individuals outcompete smaller individuals for preferred shelters. True territoriality however has not been shown in octopuses. 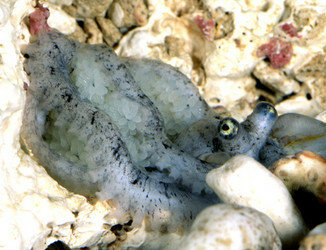 Defenses in this group range from camouflage (as seen in the photograph below), to ink dummy decoys, to ink smoke screens (see image below of ink from O. cyanea), to arm-dropping (as in Ameloctopus) and production of strong toxins advertised by distinctive colour patterns (as in Hapalochlaena). Alarm displays in certain species have been supplemented by a pair of false-eye spots, one on the lateral arm crown below each eye. These ocellate octopuses flare the webs and display these spots to produce the appearance of the head of a large predator (e.g., photograph below of Octopus mototi, Norman, 1993b). 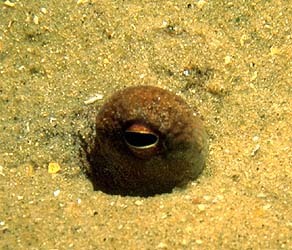 Some sand-dwelling octopuses (such as Thaumoctopus mimicus) can escape threatening sitations by burying into the sand and emerging more than one meter away. Octopus berrima, from Victoria, southern Australia , © 1996 S. Foale. 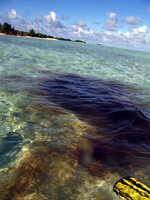 Ink smokescreen of Octopus cyanea, from Palmyra Atoll. © 2006 . Ocellated octopus Octopus mototi, from the Great Barrier Reef © 1996 M. Norman. Members of this family are found in marine habitats ranging from intertidal reefs to the deep sea (to at least 5000 m). They live in all oceans of the world from the equator to polar latitudes, and occupy a wide range of habitats from coral and rocky reefs, seagrass and algal beds, to sand and mud soft substrates. The group is represented by possible habitat generalists (such as the large Enteroctopus dofleini which ranges from the intertidal to depths in excess of 450 m) and specialists (such as Vulcanoctopus hydrothermalis which is found only in hydrothermal vents). 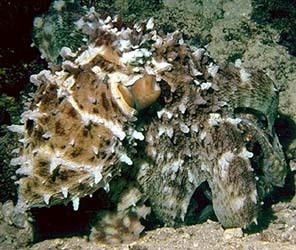 Some octopodids appear to space themselves far apart from each other, while others clump in available habitat. We do not currently know if these distributions reflect ecological preferences or the outcomes of inter/intra-specific competition. Although some species occupy a den and forage in the vicinity for weeks or longer, species studied thus far do not appear to be territorial and defend their home range from conspecifics. 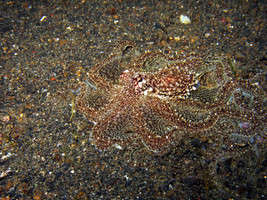 Callistoctopus ornatus foraging in less than 10 cm of water, less than one meter from the beach. Rurutu, Austral Islands © 2006 Christine Huffard; Octopus cyanea on an intertidal reef, Rurutu, Austral Islands. 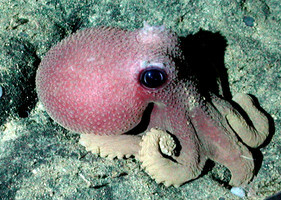 © 2006 Christine Huffard; Undescribed octopus foraging on sand plains in North Sulawesi, Indonesia; 15 m deep © 2006 Christine Huffard; Graneledone boreopacifica Davidson Seamount; 1973 m deep. © 2002 NOAA/MBARI. The following key treats clearly defined or named genera within the family Octopodidae. The generic placement of many taxa within this family remain unresolved and are thus not covered by this key. These taxa are treated below under the general category “unplaced Octopus”. Genera designated with an asterisk (*) are in urgent need of revision. Male diagnostic characters: As for many other cephalopod groups, octopus taxonomy relies heavily on the reproductive charactersof mature males, particularly structures of the modified reproductive arm (hectocotylised arm). Female material is harder to identify. Arm lengths: Use of relative arm lengths requires intact arms. A sudden change in sucker diameter at any point along an arm is an indicator of partial arm regeneration. Such arms should not be considered in assessing relative arm lengths. Boletzky, S. von. 1977. 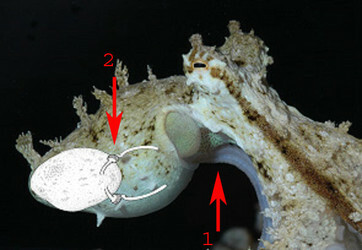 Post-hatching behaviour and mode of life in cephalopods. Pp. 557-567. In: M. Nixon and J.B. Messenger (eds). The Biology of Cephalopods. Symposia of the Biological Society of London, Volume 38. Boyle, P. R. (ed.). 1983. Cephalopod Life Cycles. Vol. II. Species Accounts. Academic Press, N. Y.
Hanlon, R. and J.B. Messenger. 1996. Cephalopod Behaviour. Cambridge University Press, Cambridge. 232 pp. Houck, B.A. 1982. Temporal spacing in the activity patterns of three Hawaiian shallow water octopods. Nautilus, 96(4): 152-156. Naef, A. 1923. Die Cephalopoden. Fauna e flora del Golfo di Napoli, 35: (I-1) V-XIV, 1-863. English translation (1972), Israel Program for Scientific Translations, Jerusalem. 292 pp. Nesis, K. 1982. Cephalopods of the World (in Russian). English translation (1987) by B.S. Levitov. T.F.H. Publication, Neptune City, New Jersey, 351 pp. Nixon, M. and E. Maconnachie. 1988. Drilling by Octopus vulgaris (Mollusca, Cephalopoda) in the Mediterranean. Jour. Zool. Lond., 216: 587-716. Norman, M.D. 1993a. Four new species of the Octopus macropus group (Cephalopoda: Octopodidae) from the Great Barrier Reef Australia. Memoirs of the Museum of Victoria (1992), 53(2): 267-308. Norman, M.D. 1993b. Ocellate octopuses (Cephalopoda: Octopodidae) of the Great Barrier Reef, Australia: description of two new species and redescription of Octopus polyzenia Gray, 1849. Memoirs of Museum of Victoria (1992), 53(2): 309-344. Norman, M.D. 1993c. Octopus ornatus Gould, 1852 (Cephalopoda: Octopodidae) in Australian waters: morphology, distribution and life history. Proceedings of the Biological Society of Washington, 106(4): 645-660. Packard, A. 1985. Sizes and distribution of chromatophores during post-embryonic development in cephalopoda. Vie Milieu, 35: 285-298. Robson, G. C. 1929. A monograph of the Recent Cephalopoda. Part I. Octopodinae. British Museum (Natural History), London. 250pp. Robson, G. C. 1931. A monograph of the Recent Cephalopoda. Part II. 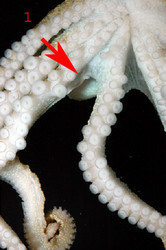 The Octopoda (excluding the Octopodinae). British Museum (Natural History), London. 359 pp. Rodaniche, A.F. 1984. Iteroparity in the Lesser Pacific Striped Octopus, Octopus chierchiae (Jatta, 1889). Bulletin of Marine Science, 35(1): 99-104. Sasaki, M. 1929. A monograph of the dibranchiate cephalopods of the Japanese and adjacent waters. Journal of the Faculty of Agriculture, Hokkaido Imperial University, vol. 20 suppl. 357 pp. Sweeney, M. J. and C. F. E. Roper 1998. Classification, type localities and type repositories of Recent Cephalopoda. Smithsonian Contributions to Zoology, No. 513: 561-599. Voss, G.L. 1988. Evolution and phylogenetic relationships of deep-sea octopods (Cirrata and Incirrata). Pp. 253-276. In: Clarke, M.R. and E.R. Trueman (eds). The Mollusca, Vol. 12. Palaeontology and neontology of cephalopods. Academic Press, London. How octopus suckers work. Pharyngula. Christine Huffard has contributed to the Life History, Behaviour and Distribution sections of this page.